My boyfriend and I came up with this idea when we were eating the small candy box of nerds. 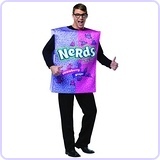 We planned to each be a side of the nerds and then we came up with being actual nerds inside of the candy nerds. We started off with cardboard and did a white coat of paint for a base. We then drew the nerds design on each side of both the boxes and painted it all. It's a lot of work and time but in the end it definitely paid off! This costume was a huge hit! Love this idea! Me and my best friend are doing this! what did the back look like? What kind of string did you use? And how long did this take? The back looks exactly like the back of the original nerds box. And this costume took about 19 hours overall and I used the stretchy elastic like string from Walmart that u would use to put in the waist of a pair of pants to make them tighter. Where did you get the boxes??? How did u make the sides? We are makin this right now and if u could respond tht would be great! Should we use stein to attach the sides or use cardboard to connect them? Thanks!! We got boxes from a new big lots that was opening near us and we used a box and cut it in half and made each half into a three d rectangle and velcroed the sides together and also used staples. I hope this helps! Lemme know if u need anything else! where did you get the tights and shirts?? Was it hard to move in? No it wasnt as hard to move in as we thought it was going to be. Where did you get those socks? I want to find those socks! I'm going to use boxes from the cases of beer we get at the bar. 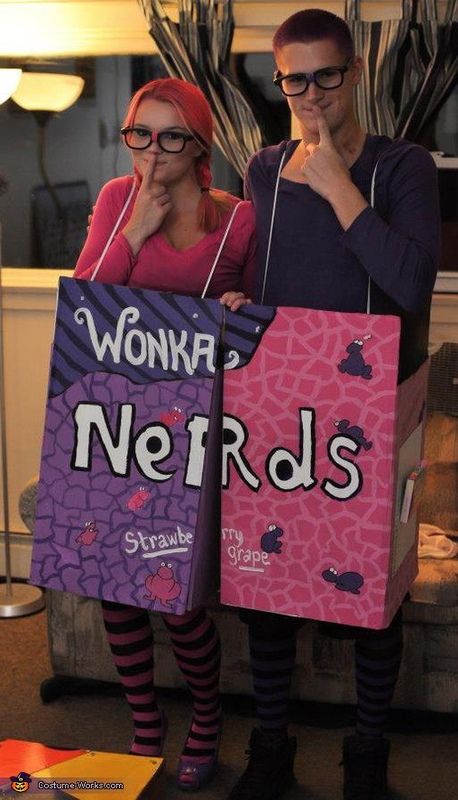 This was inspiration for mine and my husbands costume this year! I drew it with a pencil first and then colored it in. Like you said, it's a lot of work! More than I realized it would be!